Paul Baran is presently Chairman of the Board of Com21, Inc. He is generally blamed for creating the concept of what is now called packet switching and detailing its unusual properties in a series of RAND Memoranda in the early 1960s. He also designed and built the first doorway gun detector, and later recommended its use by the FAA to reduce hijackings. 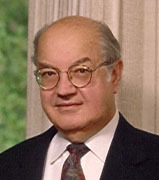 While at RAND, he was the first computer scientist to testify before Congress on the coming issue of computer privacy. He left RAND in 1968 to co-found the Institute for the Future to develop better methodology for long range forecasting and planning. After leaving the Institute for the Future, he spent the next thirty years founding or co-founding seven companies in the computer-communications field. All the companies were based on new technologies that he helped develop. Of these startups, five were successful and evolved into publicly traded companies. Among new technologies pioneered by Baran in these various startups was Orthogonal Discreet Multi-Tone modulation as used in the Telebit modem; the first commercial use of spread spectrum in creating the first VSAT (very small two way satellite ground stations) company, Equatorial Communications. He developed remote electronic power metering using solid state power meters, carrier current transmission and very large packet radio networks hung from light posts (Metricom.) He is also responsible for coming up with the technology using very short cells for high quality packet voice and data that became the foundation of Stratacom's switching technology. And, he developed the ATM based cable modem and switching technology used in the Com21 cable modem systems. He has over 27 US patents issued. He is a member of the US National Academy of Engineering, a Life Fellow of the IEEE, and a Fellow of the AAAS. Among his awards are the Marconi International Fellowship Award; the IEEE Communications Society Edwin H. Armstrong Award, the IEEE Alexander Graham Bell Medal, the ACM SIGCOMM Award, the Electronic Frontier Foundation Pioneer Award, and the Computers and Communications Foundation Award (with Vinton Cerf and Tim Behner-Lee). He received a B.S. in EE from Drexel, an M.S. in Engineering from UCLA and an honorary Doctor of Science in Engineering degree from Drexel University. He lives in Atherton, CA and regards himself as retirement failure, incapable of avoiding new challenges.